Many users want to quickly find unlinked AdWords accounts and link to them, and the new wizard makes this easy. A quick glance at the AdWords account list in the screenshot above shows which accounts are and aren’t linked. To link additional accounts, just mark the “X” in front of each account, and then continue. With this launch, linking to AdWords now takes place at the Analytics property level instead of the account level. This is a benefit for those with many properties in a single Analytics account; if you have different teams of people managing each property, you no longer need to give them access to the full Analytics account in order to link to AdWords. Now, you can simply give that team access to only the appropriate property, and they can manage AdWords links. All it takes is property-level Edit permission to create and update AdWords links. This is another Analytics feature enabling large-scale Analytics customers to better control access to their Analytics accounts. Once the new linking process has launched to your account, you’ll be able to see all these features. Log in to your Analytics account, click the Admin button in the header, and you’ll see a new AdWords Linking section in the Property column. Log into your Analytics account soon to update your AdWords account links and gain rich marketing insights. To maximize marketing investment and return, advertisers need insights into the effectiveness of their ads. However, gaining such insights is often overly cumbersome. This is why we’re pleased to announce that in the coming weeks, the Google Analytics and AdWords account linking process is becoming even more streamlined, making it easier for advertisers to quickly gain rich insights. 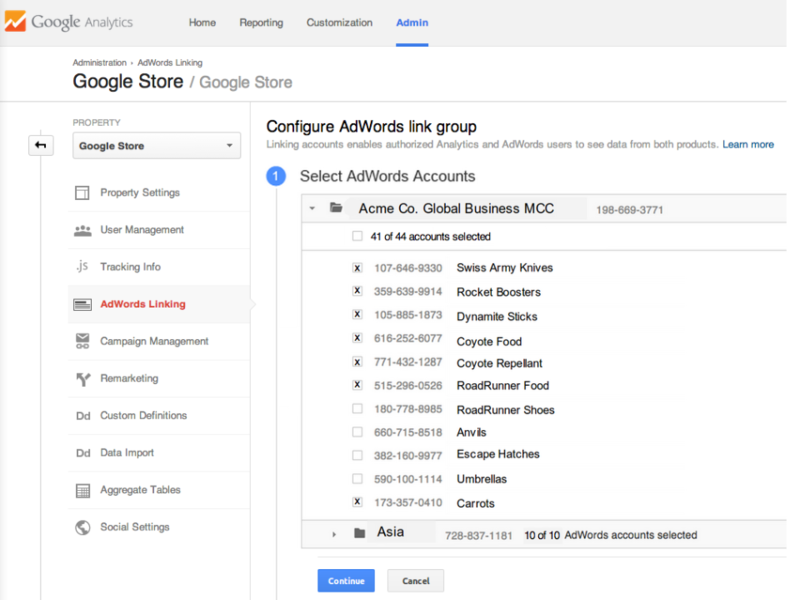 The new linking process allows you to link multiple AdWords accounts all at once. This enables more tightly controlled linking access for each Google Analytics property.